This gooey chocolate brownie is the best keto chocolate mug cake you’ll ever make and it’s ready in less than 2 minutes! Plus, it’s entirely gluten free, sugar free and dairy free. A nut free option is also available for those who are nut free. We all have chocolate cravings, I know I do. That’s why I make sure to have a list of treats that I can make in no time when I have such cravings. This low carb mug cake is definitely one of my favorite treats to make when in a hurry or when I need a chocolate treat ASAP. But it’s also one of the gooiest, moistest and chocolatey cake that I’ve ever made, which is why this is on the menu at least twice a week! I think I’ve been going through chocolate withdrawal since I finished eating all of my avocado brownies and that’s why I needed a quick 2 minute mug cake to satisfy all of my cravings! 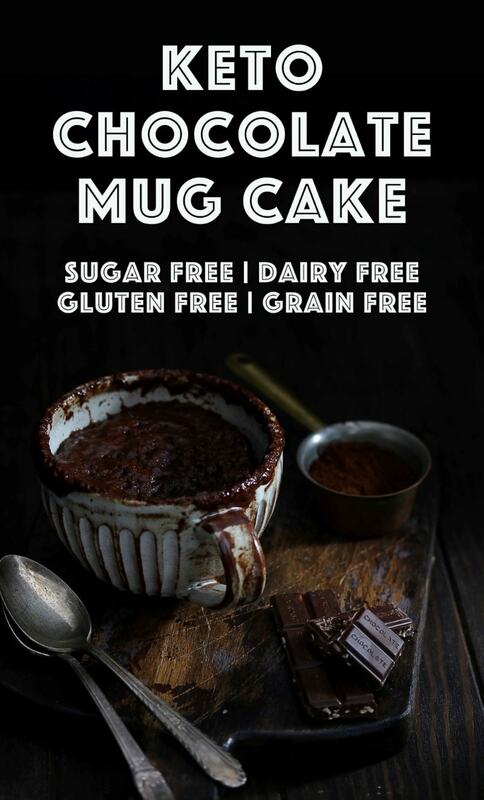 But the greatest thing about this low carb mug cake is that it’s completely sugar free, gluten free and dairy free. Plus it can easily be made nut free! I also provided instructions to make it with different sweeteners. What Sort of Mug or Cup Should I Use? Make sure you use a large cup or mug that can hold at least 1.5 cups of liquid. That’s the most important part. If your mug or cup is too small, the cake will overflow out of the cup and create a huge mess in your microwave (personal experience). If you don’t want to use a cup, you can also use a large ramekin dish. Ramekins are both microwave-safe and oven-proof so they are quite handy to have on hand. Also, make sure you use a microwave-safe mug or cup. Do not use glass as glass will shatter in the microwave from the heat of the cake. How Many Carbs in this Low Carb Mug Brownie? This low carb mug brownie has about 7.86g total carbs, with 4.3g fiber including sugar alcohols. This single serving brownie has 3.56g net carbs. This is the nutritional information for the almond flour and Lakanto version of this chocolate mug cake. If you switch the ingredients, just know you’ll have to recalculate the macros. Fresh Blackberries, Raspberries or Strawberries. What Sweeteners Should I Use? You have a couple of options to make this low carb mug cake, including erythritol, Lakanto, Sukrin, xylitol, stevia and monk fruit. My favourites include Lakanto, Sukrin and xylitol. My least favourite was definitely stevia (a very rare occasion) as it left quite a big of a bitter taste and didn’t go very well with the chocolate flavour. If you decide to use erythritol, Lakanto or Sukrin, know that you’ll have to eat the keto mug cake as soon as it’s cooked. Try not to chill it in the fridge afterwards as the erythritol will crystalize and you’ll have a huge grainy texture in your keto mug cake. Since I made so many versions using different flours and sweeteners, I couldn’t possibly eat all of the keto chocolate mug cakes so I left many in the fridge overnight and all of the ones made with some kind of erythritol turned grainy. If you use xylitol, it’ll stay perfect even if chilled in the fridge as xylitol does not crystalize in cooler temperatures. Just be careful you don’t have a dog around as it can be toxic to the little pups! How to Make this Keto Mug Cake? Lucky for you, it’s ridiculously easy to make this chocolate keto mug cake. 7 ingredients and 3 steps later you’ll have yourself a delicious homemade low carb mug cake. First, you’ll want to mix the dry ingredients together in a large mug or cup that’s microwave-safe. Then you’ll add in the wet ingredients and mix again until there are no more flour bumps. Lastly, you’ll pop your mug into the microwave and microwave for 1 minute 30 seconds to 1 minute 40 seconds at 600W. Once that’s done, your keto chocolate mug cake is ready to eat. Serve with your favourite toppings or as is, and your sweet tooth will be satisfied for the day. How Long Should I Microwave my Mug Cake? 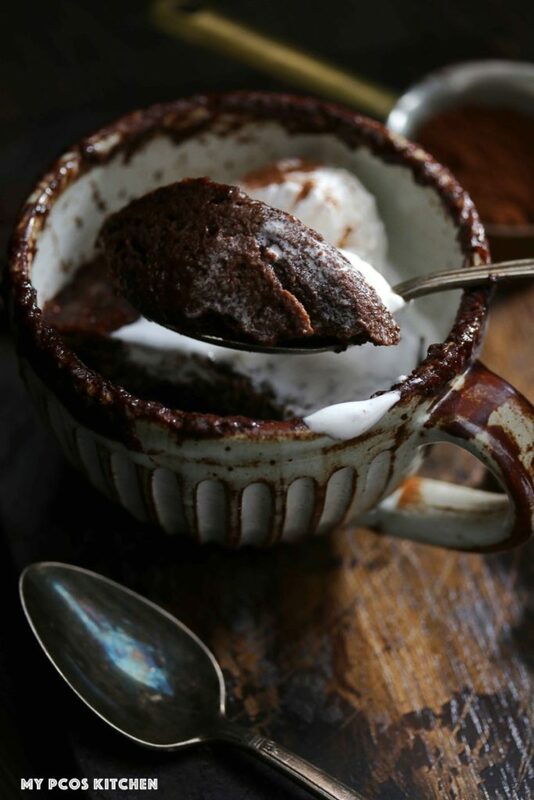 You should microwave your healthy chocolate mug cake for 1 minute and 30 seconds or 40 seconds. Since my microwave is a 600W one, I needed to microwave my keto chocolate mug cake for 1 minute and 40 seconds and the sides and top were still a little wet, just how I like it. I don’t recommend microwaving your keto mug cake more than 1 minute and 40 seconds as the chocolate might start to burn. Can I Bake the Mug Cake Instead? Yes! 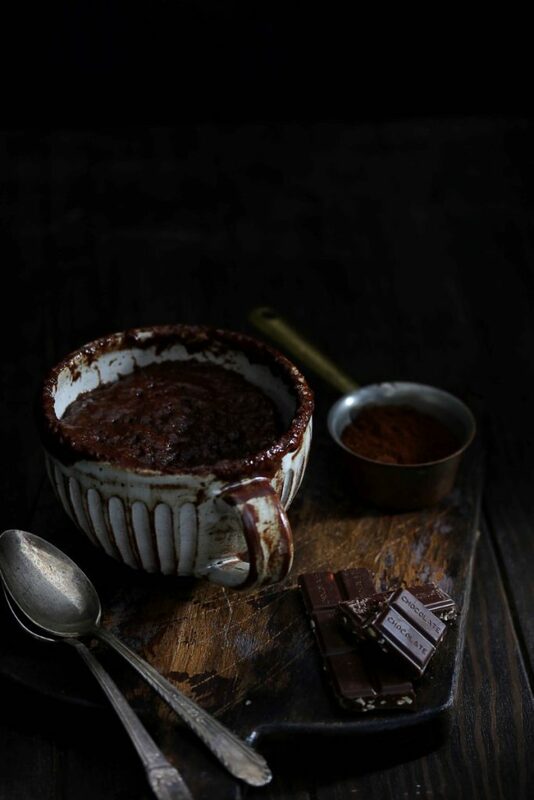 Simply bake it for 22 minutes at 180C/350F and you’ll have a super gooey chocolate mug cake ready to be eaten! Just make sure to use an oven-safe bowl or ramekin as you don’t want your cup to shatter in the high heat. Both work and both are equally delicious! Just use whichever one you have on hand and you’ll have a 2 minute mug cake ready to eat in no time! If you’re allergic to nuts, then you can make my nut free mug cake instead! I give three options that you can choose from depending on what type of flour you have on hand. Simply replace the 2 tbsp of almond flour for 2 tsp coconut flour, 1.5 tbsp sesame flour or 2 tbsp powdered peanut butter flour. The peanut flour kind of tastes like a peanut butter cup so it’s one of my favourite nut free flour for this keto mug cake recipe. Since there isn’t a lot of coconut flour, the coconut flour mug cake does not taste like coconut, which is a relief because I absolutely hate the taste of coconut. The sesame flour works, but makes the cake a little dry and crunchy from the seeds. 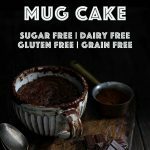 Here is a recap of all the tips and substitutions you can make for this low carb mug cake recipe! 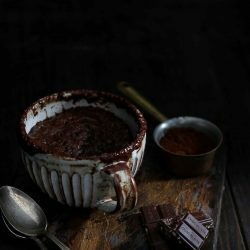 Note that this low carb chocolate mug cake can be made with only 1 tbsp of refined coconut oil instead of 2, but it comes out way less moist. Make sure to use refined coconut oil and not extra virgin so that you don’t get a coconut taste in your brownie batter! Instead of coconut oil, you can use butter, ghee, shortening, or cocoa butter. The espresso powder is completely optional, but it does give it a nice kick. Instead of 2 tbsp of almond flour, you can switch it for 2 tsp coconut flour, 2 tbsp sesame flour or 2 tbsp peanut flour. Instead of 2 tbsp of Lakanto Golden, you can use 1/4 tsp stevia powder or monk fruit powder, 2.5 tbsp of erythritol, 2 tbsp of Sukrin Gold, or 2 tbsp of xylitol. 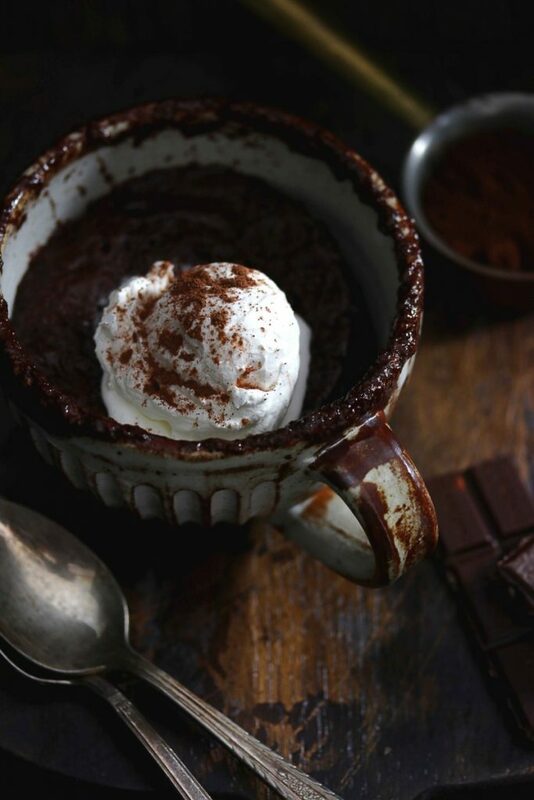 Instead of microwaving this microwave chocolate mug cake, you can bake it in the oven for 22 minutes at 180C/350F. Instead of almond milk, you can use any other type of milk you want. This could be any other nut milk, dairy milk, or heavy cream. You can use from 1 tbsp to 1.5 tbsp of cacao powder. I much prefer the 1.5 tbsp version as its way more chocolatey. A rich, fudgy and gooey chocolate cake ready in less than 2 minutes! Mix the dry ingredients into a microwave-safe large mug, cup or ramekin. Add the wet ingredients and mix well. Add the mug into the microwave and cook for 1 minute and 40 seconds for a 600W microwave. If your microwave is stronger, you'll need to cook it for a shorter time. If you want to bake your mug cake, bake it in the oven for 22 minutes at 180/350F. Once your chocolate cake is baked, feel free to eat as is or top with your favourite topping! I made this and its one of the better mucg cakes i have tasted! I added a tbs of crunch pb after done and a sprinkle of lilys choco chips. Great keto treat!! Love mug cake! Can’t wait to try this. I have never tried making a mug cake but it looks tasty! I am already in love with this just by looking at the pictures. Wow, this looks amazing! Why am I not making myself more mug cakes? I’m trying this one very soon! Wow and so yummy!! How nice to have one serving of such yumminess! I have yet to try a mug cake but now I think it’s time to try! Such a beautiful and decadent mug cake! I can’t believe it’s keto. I’ll have to try this! Such gorgeous photos! And I love adding a bit of espresso powder to chocolate recipes. It really makes a big difference. Sounds delicious. 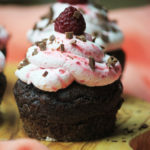 I’m always up for trying new chocolate recipes! mug cakes are a little too easy and too addicting! 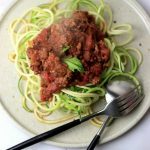 Omg this recipe is so great!! This is perfect for when you want something sweet but don’t have the time to make a whole dark cake! Oh Mira.. This was so delicious! Because of my allergy to almonds, I used sunflower flour. I also threw some Lily sugar free chocolate chips in there. After microwaving, I covered it with sweetened heavy cream and added a few raw pecans on top. Heavenly! Thank you! This recipe is such a winner, Mira! Thank you for creating and testing so many versions to give us all options for our own particular needs. My husband made this for my birthday on Wednesday! I had him split it into two small ramekins prior to baking: and it was just the right amount for each of us. He baked it in our convection toaster oven using your directions. I do a lot of playing around with recipes to suit my needs, so we subbed Sweet Leaf Stevia Drops, 2 tsp (Vanilla Cream) for the sweetener. There was no bitterness or aftertaste. Also, since we only use and have cocao (raw) powder, we just used baking soda (1/4) teaspoon instead of baking powder. We chose ghee for our fat. We also added a tsp of vanilla extract. The texture was perfect (though it peaked a bit on top.) We topped it with unsweetened Pascha cocao baking chips (just 7g each) right out of the oven, and then just one ounce each of frozen raspberries, thawed/heated. What a delight! We’ll have to try the micro version, to compare, but I’m so happy with this, I know we’ll be making it again, many more times. (We might try a future version with almond extract for an Almaretto-like taste. Orange would be yummy too! The variations and combinations are endless!) Thank you, again! Mira, thank you for all the details (like 600 watt microwave–mine is 1540–a big difference)! Your recipes always turn out well for me because you experiment so much. Thank you for all the variations. I love getting your recipes, because I feel like they’re do-able. Thank you! MOUTHWATERING 🙂 ! Thank you for sharing your great recipes, Mira! Hello. Your fix to add in 1 egg did not get transferred to the printable recipe. Thank you for your great recipes. Hi Shirley, are you sure? I just checked the 1 egg shows up without any problems. Try refreshing your browser? Looks yummy, but is there an egg missing from the ingredient list? Sorry I forgot to write it! That’s what you get for writing a recipe at midnight…Just fixed it!! There is an egg in the picture, but I don’t see it in the recipe? Do I use an egg? There’s clearly an egg in the pictures in the recipe. Yet, unless I’m mistaken, I don’t see an egg in the ingredients list. Is there a catch there? Would love clarification on that, as I’d like to try your recipe. Is this supposed to have egg in it? 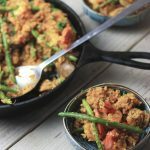 I want to try this recipe – today if possible! Quick question – your photos show that a egg is added to the mug cake, but there is no mention of eggs in the recipe. Do I follow the recipe as written? ie. no eggs. Thanks! Never mind 🙂 i scrooll down and saw your recommendations for a regular oven thank you. Please not everyone has or uses a microwave could please let us know here for baking this in a regular oven for how long and at what temperature. Hi Alicia, baking in the oven instructions are included in the recipe. Please look at step 3. Your recipe looks amazing. Can you clarify the flour substitutions. It says instead of 2 tsp coconut flour can be substituted for 2 tbsp almond flour. Is that correct? Thanks so much! Looks yummy! Does it have eggs? One of your pics shows an egg, but the recipe doesn’t have egg on the ingredient list. Would brown rice syrup work ok for the sweetener? I would assume so. I’ve never used that in any of my baking days, but if it’s like sugar then 1-2 tbsp should be enough. You can always taste test with your finger to see if it’s sweet enough.